Armstrong Chemtec's continuous scraped surface heat exchanger is a double pipe element that is generally used in cooling crystallization and viscous cooling duties. Heat transfer occurs across the wall of the inner pipe as the coolant flows in the annulus between the outer pipe and the inner pipe containing the process fluid. The inner pipe ranges from 6” NPS to 12” NPS and the outer pipe may be as big as 16” NPS. A typical commercial installation will consist of multiple double pipe elements connected in series, with each element 20 to 50 ft long. The modular design provides scalability to account for changes in process requirements. The exchangers are designed to run without clogging for extended periods between hot washings. Fouling tendencies of some slurries are overcome by continuous scraping of the heat transfer surface. The design is capable of handling higher MTDs than shell and tube equipment. Operating temperatures range from -75 °C to +250 °C. Weight percent solids as high as 65% have been handled. Can handle process fluids with viscosities in excess of 10,000 cP. Near plug flow profile allows for easy transition from batch to continuous process. Scraped surface crystallizers are more cost effective for larger installations where vacuum crystallization may seem attractive. The design minimizes shear stress on delicate crystals but is rugged enough to handle tough crystals. Simple, self-contained construction eliminates the need for excessive instrumentation, condensers, vacuum systems, etc. 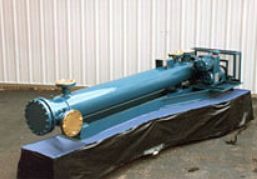 Armstrong Chemtec continuous scraped surface heat exchangers are a preferred technology for dewaxing lubricating oil. The wax has the same boiling point range as the bulk lubricating oil, but has a much higher freezing point, making crystallization a very effective way to separate the two. Armstrong Chemtec is frequently involved in the process design for dewaxing processes, lending its expertise to issues involving heat transfer, residence time, pressure drop, and coolant selection. Continuous scraped surface heat exchangers efficiently cool highly viscous fluids. As the fluid cools on the inner pipe wall, the viscosity increases, creating a static boundary layer and reducing heat transfer. Scraped surface heat exchangers greatly reduce the thermal resistance at the cold wall by constantly disrupting (reducing) the wall boundary layer and exposing the wall to warmer fluid. Armstrong Chemtec offers a pilot testing program to help determine if crystallization is the best method of separation for a given application. This allows a detailed process evaluation to be carried out before capital is spent on scaling up the process. A number of pilots, ranging in size from 6” NPS to 12” NPS are available for rent. Some pilots are carbon steel throughout, but most have a type 316 stainless steel inner pipe. Armstrong Chemtec's engineers have helped with dozens of continuous scraped surface crystallizer piloting programs. This has resulted in a considerable database of experience covering over 300 different compounds. Consultation with Armstrong Chemtec engineers with access to this knowledge base often saves considerable development time and effort. 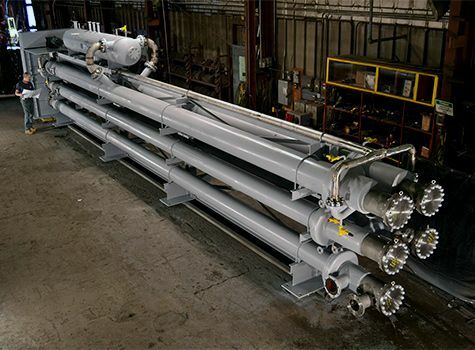 Double pipe scraped surface heat exchangers can be used as crystallizers by cooling a product which has a lower freezing point than other products in a mixture. Such cooling generates crystals in which purity is very close to 100%. Armstrong Engineering has decades of experience with over 350 different chemical mixtures. Scraped Surface heat exchangers may also be used as viscous coolers, controlling the viscosity and temperature of exothermic fluids. Scraped surface crystallizers have been used almost universally in solvent dewaxing processes. 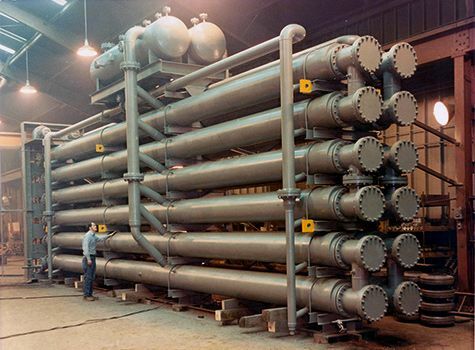 Exchangers may be one double pipe element or as many as 14, stacked 7 per side in a frame. Lengths vary from 12 feet/ 4M to 50 feet / 16M overall. Mechanical seals eliminate release of unwanted solvent to atmosphere. Single drive motors on each double pipe element will allow the processing of high volume / wt. solids Armstrong remains the largest supplier to the global refinery, chemical and specialty chemical business and a full video is available on YouTube.